Save all your favourite photos and videos for Instagram! 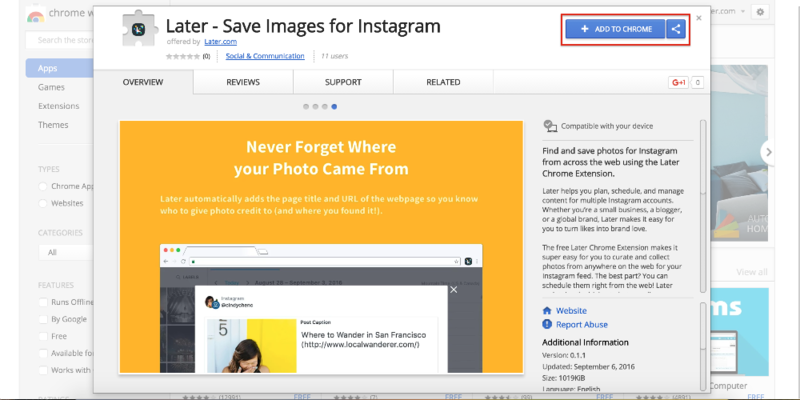 Later’s browser extension makes it easy to collect beautiful photos from all your favorite sites. With unlimited storage space available in your Media Library it’s now easier than ever to gather content and start building a robust content library. Simply browse through the web, find a photo, and add it directly to your Media Library. Note: Browser extension is currently only available for Google Chrome. Click here to download it. Click here to go to Later’s Chrome Extension page. Once you’re on the Later Chrome extension download page, click Add to Chrome to add it to your browser. First find the photo you’d like to add to your Media Library. Note: Notice that Later automatically adds media notes to your photo, that way you’ll always have all the information needed to properly source the photo. And you’re done! Your new media item will now be stored in your Media Library and appear in the side library ready for scheduling.